An AUTO SHOW, also known as a motor show, is a public exhibition of current automobile models, debuts, concept cars, or out-of-production classics. It is commonly attended by automobile manufacturers. 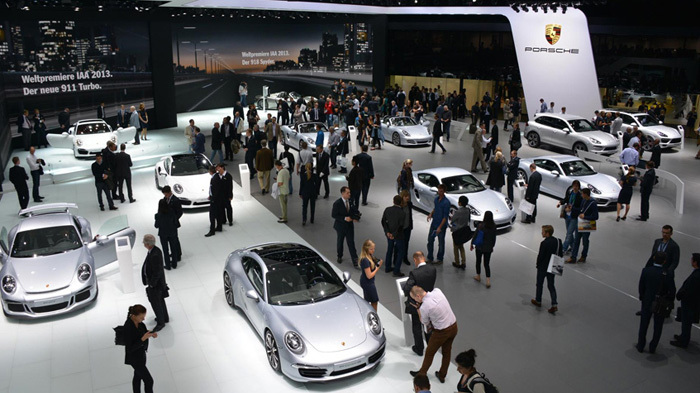 Most auto shows occur once or twice a year. They are vital to car manufacturers and local dealers as a public relations exercise, for advertising products, and for increasing publicity. 7 FUTURE-REVEALING DETAILS FROM 2018 GENEVA MOTOR SHOW - Wired. 11 Most Ridiculous Cars at the Geneva Motor Show 2016 - Wired. 18 hot cars we can't wait to see at the 2019 Geneva Motor Show - "The Geneva Motor Show is the first major European auto show of 2019. The show will feature the latest offerings from Aston Martin, Bentley, Audi, Mercedes-Benz, Ferrari, Lamborghini, Polestar, VW, Subaru, Honda, Toyota, Nissan, Mazda, and Pininfarina." 2018 DETROIT AUTO SHOW IN PICTURES - The Verge. Geneva goes electric: 2019 Motor Show - in pictures - "Electric cars featured heavily at the 89th annual motoring showcase event in Switzerland, as manufacturers rolled out new electric and hybrid models to address tougher emissions requirements in Europe. SUVs and SUV-like crossovers also had a good showing, in addition to new prestige and performance models and concepts from car makers." See the stylish & confusing vehicles from the Paris Auto Show - engadget. Swiss Classic World - since 2014. Lucerne. High-quality classic car show focussing on classic cars. Turin Auto Show - (1900-2000). (Italian: Salone dell'Automobile di Torino) was an auto show held annually in Turin, Italy.